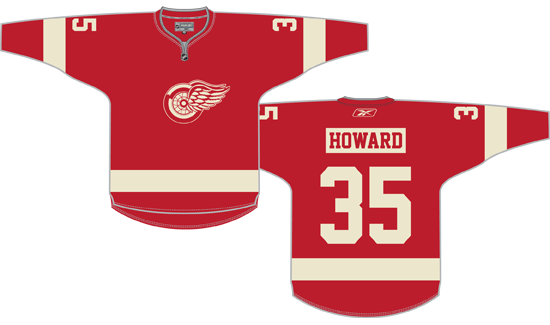 With the NHL Draft completed and free agency not opening up for another week, I figured now was as good of a time as any to take a look at another possible sweater design for the Red Wings in the 2013 Winter Classic. This one is one that many people were clamoring for the last time I rolled out a Winter Classic concept, having its roots in the first jersey worn in Detroit after the team changed its name to the Red Wings. There were a lot of people calling for a Winter Classic jersey with the Winged Wheel on it, which I agree with. The 1932 jerseys marked the first appearance of the Winged Wheel in Detroit so there’s a lot of history behind it. While I made a lot of changes from the original sweater design (noted below), the main similarity is that the old-school version of the Winged Wheel is used and that the wheel itself is centered on the chest, rather than the version we have now where the entire logo is centered. While I say the 1932 jerseys were the basis of this design, that’s really just the logo. Solid numbers weren’t worn on the back until 1937. Numbers weren’t added to the sleeves until 1961. The red jersey didn’t get a nameplate until 1977. The white stripe was only lifted off the hem from 1983 until 1986. I feel like the sleeve numbers and the nameplate had to be added. There’s no excuse for no sleeve numbers with that much empty space on the arms, unlike some previous designs (of course, I would have said that about the design the Red Wings used in 2009, too). The nameplate uses a serifed font like the Wings use in the preseason. I went with the current trend of an opposite-colored nameplate simply because it is a trend. For the same reason, the white used is a “vintage white” while the red is a “vintage red” that’s darker than the usual red. The white stripe was moved off the hem because I don’t like how the hem looks in the Edge jersey cut. It’s also one more thing slightly different from the current jerseys in a design that’s already pretty similar to what the Wings wear now. As with my previous designs, I would expect this design to include a lace-up collar, I just don’t have a template that can show it. I could also see something like this being done but in standard Detroit colors and/or without the opposite-colored nameplate. The main reason I could see the Wings’ rolling out something like this is the same reason so many people wanted to see it: The Winged Wheel. This gives them a vintage look while still featuring their famous logo. I have no advance knowledge of what the Red Wings or the Maple Leafs will wear on New Year’s Day, this is just a concept of something Detroit could wear. I know my template isn’t perfect. I’m admittedly too lazy to fix it. I know the Reebok vector would be replaced by their wordmark, for example. I’m still looking for feedback on my charity event idea. The silence makes me think everyone hates sick children. The Detroit Red Wings announced on Monday that assistant coach Jeff Blashill has been named head coach of the team’s American Hockey League affiliate, the Grand Rapids Griffins. Blashill replaces Curt Fraser, who left the Griffins after four seasons to take an assistant coaching spot with the Dallas Stars. The Griffins will be Blashill’s fourth team in as many seasons. He was the head coach of the USHL’s Indiana Ice from 2008-10 before jumping to Western Michigan University to become their head coach for the 2010-11 season. The Red Wings brought him on as an assistant last season. I’ve noted before that the draft isn’t as interesting to me as I acknowledge it should be, as I grew up in a time when the players the Red Wings drafted seemed unlikely to ever play for the team anyway. As such, while I think some of Detroit’s draft picks this season are interesting, I’m not reading too much into any of it. Bodin came in late to win the best name award from me. It would have gone to Frk but I have to go with a guy named Rasmus. I like the Frk pick, it’s a typical Wings move in that he had been highly-rated and slid, with the Wings willing to take a chance. The kind of thing we always point out Ken Holland doing with free agents like Danny Cleary or Mikael Samuelsson. Same with Athanasiou, to a certain extent. We’re not going to see any of these guys in Detroit any time soon, though, so that’s why you won’t see me getting too excited right now. Swiss media – followed closely by several Detroit-based outlets – reported this morning that the Red Wings have reached a deal with forward Damien Brunner. Brunner was the leading scorer for Zug of the Swiss National League A last season. He scored 24 goals and added 36 assists in 45 games. At 5’10” and 176 pounds, Brunner is small but has been described as being smooth-skating and having a good shot. While a deal may have been agreed upon, the Wings cannot formally sign Brunner until July 1. Additionally, he is not a lock to play in North America for 2012-13. He has a Swiss contract for the coming season with an out clause but reportedly does not want to play in the AHL. My favorite online video game-based charity event kicks off its fifth edition today, so I’m in the mood to talk about that kind of thing for a little bit. Mario Marathon has raised almost a quarter of a million dollars for Child’s Play Charity over the last four years. Last year alone they raised $112,675. It’s a fantastic event that I’ve always found extremely fun to watch and it’s all for a great cause. I’ve been brainstorming an event inspired by Mario Marathon for a couple years now, an idea that’s turned into what I’m calling Retro Hockey Challenge. A marathon of old-school hockey video games, played as a tournament. I posted a full description of the idea last winter but recieved absolutely no feedback, so I put it on the back burner for awhile. With Mario Marathon’s return, however, I’m inspired to take another look at it. I think hockey is cool, hockey video games are cool, and charities that help sick kids are cool. This is an idea that combines all of that. But if it were just me, I’d play the games myself and donate to the charities myself. I want to know what others think, and whether this could be an event that would draw some interest. Please provide any thoughts you can. Replying directly to this post (you can log in with a Twitter or Facebook account if you don’t want to create a DH.N account), tweeting to@detroithockey96 or @retrohockey, or posting to the DH.N Facebook page will all work.I look forward to hearing what the community has to say. The Detroit Red Wings were shutout of the 2012 NHL Awards Thursday night. Pavel Datsyuk was the team’s only nominee. A finalist for the Frank J. Selke Trophy as best defensive forward, Datsyuk lost out to Patrice Bergeron of the Boston Bruins. Datsyuk had won the award three times previously, in 2008, 2009 and 2010. Datsyuk was not a finalist for the Lady Byng Memorial Trophy, which he had won for four consecutive years from 2006 to 2009. Similarly, retired captain Nicklas Lidstrom was not up for the Norris Trophy as best defenseman, an honor he had claimed seven times in his career. With no Red Wings claiming an award, it marks the first time in twelve seasons that the team has gone without an award winner. The Detroit Red Wings released their full 82-game schedule for the 2012-13 season on Thursday. Already known were the home opener – a matchup with the Nashville Predators on October 12 – and the Winter Classic against the Toronto Maple Leafs on January 1, 2013, at Ann Arbor’s Michigan Stadium. The Wings start their season with eight of their first eleven games on the road. They return home on November 6 for a five-home homestand, which is shortly followed by a season-high seven-game homestand from November 27 to December 13. Their longest road trip is a five-game swing in January and they visit all four Western Canadian teams during an October trip. They play on back-to-back nights 13 times, with only one of them being two consecutive home games. One of those is a home-and-home series with the Columbus Blue Jackets in March. The Wings also face the Nashville Predators and Edmonton Oilers in a home-and-home series. Each of Detroit’s Original Six rivals will visit the Red Wings this season. The Wings will also play at home and on the road against the Pittsburgh Penguins, New Jersey Devils and Winnipeg Jets. MLive’s Ansar Khan reports that the Red Wings will open their 2012-13 season at Joe Louis Arena hosting the Nashville Predators. The Predators eliminated Detroit from the 2012 postseason in a five-game first-round matchup. The full schedule is expected to be announced on Thursday. The Detroit Red Wings announced on Tuesday that they have signed forward Darren Helm to a four-year contract extension. As per club policy, financial terms of the deal were not announced. Earlier in the day, TSN’s Darren Dreger reported that the deal was worth $8.5 million, for an annual cap hit of $2.125 million. Helm just completed his fifth season with the Red Wings after being selected by the club with their fifth round pick in the 2005 NHL Entry Draft. He’s scored 32 goals and 17 assists in 248 games, mostly in a penalty-killing role as a third- and foruth- liner. He missed the final ten games of the 2011-12 season with a knee injury. He returned to start the playoffs but played only one game, taking a skate to his right forearm that caused a lacerated tendon. He’s expected to make a full recovery for the 2012-13 season. Helm was set to become a restricted free agent on July 1. I’ve had my head in code all week so I’m getting to this a little late but I wanted to take the time to say a few words anyway. On Wednesday night, Jamie Samuelsen posted to his blog at the Freep that maybe certain numbers currently retired by Detroit-area sports teams should be unretired to allow new players to honor those who the numbers were retired for in the first place. Yesterday, Michael Petrella over at TPL touched on it as well. Personally, I’m against unretiring numbers unless the number never should have been retired in the first place (subjective, I know). Sometimes teams do stupid things and there should be an option of undoing that. I hate the fact that the Minnesota Wild have #1 retired in honor of their fans, for example, and would love to see a player go there and wear it. As much as I’ve complained about what goes in the rafters at the Joe, the Red Wings have a higher standard for jersey retirement. Maybe too high, as Larry Aurie’s #6 isn’t up there and should be. As such, I can’t see any reason for one of the Wings’ six (or seven once you include Aurie) retired numbers being returned to use. But if I have a hard time explaining to Josh why the second baseman doesn’t actually stand on second base, I’ll have a much harder time explaining the theory behind a retired number. Wouldn’t I? That said, I have a specific case where I think the Red Wings should open up a currently-unavailable number for use again, and given what this week is I expect it to be unpopular. I think that when Tomas Holmstrom eventually retires as the last of his remaining teammates, Vladimir Konstantinov‘s #16 should be returned to circulation. Not handed out to some rookie at training camp, but available if an established player came to the team and wanted it. Konstantinov’s injury was tragic and clearly inspired his teammates on their 1998 Stanley Cup run, but he’s not Gordie Howe or Ted Lindsay or Terry Sawchuk or Alex Delvecchio or Sid Abel or Steve Yzerman or Larry Aurie. If tragedy is enough to inspire a permanent number retirement, why is Brendan Smith wearing #2 in Detroit? Jiri Fischer may have a better life than Konstantinov but his career ended just as suddenly, with the added impact of coming in the middle of a game. Coming the week of the fifteenth anniversary of the car crash that ended Konstantinov’s career, it feels wrong to suggest that the Wings’ honor him less. That said, I’ve always felt like his number being held out of circulation was more about keeping him a part of the team he was pulled away from. When Holmstrom retires – whether this year or next – the last remnant of that team will be gone. It’ll be time to make #16 available again.